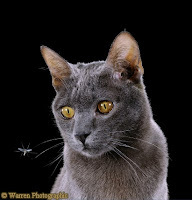 Korat is a stunning short haired cat breed. It is one of the oldest of domestic cats and is amongst the few natural cat breeds in existence today. Korat traces its origin to the land of Siam, or Thailand, many centuries ago. There it has been revered for a long time and is considered an emblem of good luck. It is known as Si-Sawat cat in the native language. Korat was brought over to the western countries by the end of nineteenth century. However it was not until the beginning of later half of twentieth century that Korat was formally introduced as a breed in United States and United Kingdom. A medium sized feline, Korat is surprisingly heavy for its size. It packs a lot of energy in its muscular, somewhat stout physique. Coat is single layered and seldom sheds or tangles. It occurs in a uniform bluish silver color and is not seen in any other color or pattern. Hair are bluish at base and become tipped with silver, giving rise to a unique glow from the shiny fur. Head is famous for its 'heart-like' shape, with beautiful amber eyes that become brighter as the cat ages. Korats are greatly valued in their land of origin. They are seldom commercially sold and are given the status of a national treasure by Thai government. They are therefore very hard to import from Thailand and as a result quite rare in most parts of the globe. Gentle and sweet cats, Korats are well suited to a house with other pets and children. They are quiet and not overly demanding. Korats have very well developed senses and are startled by sudden loud noises. 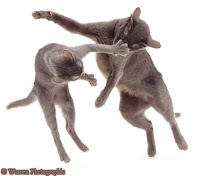 They are alert and active cats and take little time in developing strong bonds of affection with their humans. Cuddly and adoring felines, Korats are very people-oriented and enjoy company of their owners who cherish them in turn, charmed by the dazzling green eyes and luminous fur of these pretty cats. I love this cat not just because of how it looks but also because of how it acts. Looks like a russian blue to me, especially the middle pic. Never heard of this cat before.